Complete 1993 Sports Illustrated special issue autographed on the cover in blue marker by 1968 Cy Young winners Bob Gibson and Denny McLain. 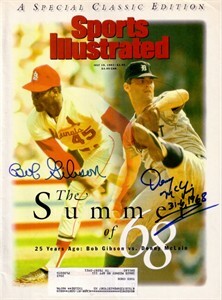 McLain added his record (31-6) and 1968 to his signature. With certificates of authenticity from Mounted Memories (McLain) and AutographsForSale.com (Gibson). Has subscription label, in superb condition. ONLY ONE AVAILABLE FOR SALE.